Entrance hall: With natural stone flooring and an armchair. Bedroom 1: Overlooking the garden with a king-size bed, bedside chests and lamps, built-in wardrobe and a chair. Shower room: Fitted with a contemporary walk-in shower, hand basin, heated towel rail and WC. Kitchen: well-equipped with electric cooker, fridge, pantry, washer/dryer, microwave and dishwasher. There is a separate freezer under the stairs. Dining area: has a large table with industrial style hanging lights and plenty of space for up to 8 guests to dine in comfort. Garden Room: fabulous oak-framed room with high ceilings and exposed beams. This superb room is light and spacious and overlooks the private garden. The feature point is a wood-burning stove with steel flue, two large comfortable sofas, leather armchair, freeview TV, DVD, selection of books and games. Bedroom 1: Pretty room with a king size double bed, chaise longue, bedside tables and lamps, open fireplace and a built-in wardrobe. En-suite Bathroom: bath, hand basin and separate WC. Separate WC: with hand basin. Bedroom 2: Another pretty room overlooking the garden with wrought iron twin beds, bedside table and lamp, chest of drawers and wardrobe. Bedroom 3: lovely room with single bed, chest of drawers, bedside table and lamp. There is a gate from the lane into the shingled front drive where there is parking space for two cars. Lawned gardens surround the house and there is garden furniture and a barbecue. This is a really quiet and peaceful location, yet only a short cycle or 10 minutes walk down to the Burnham Deepdale shops and petrol station. We have been coming to Norfolk for the last 12 years and have always booked through Sowerbys. For the number now in our party we will book this cottage again - loved it! We really enjoyed our stay and appreciate the owner allowing us to take both of our Norfolk Terriers who had a fabulous time. We loved the peace abd quiet and lock of light pollution! Burnham Deepdale is a picturesque small coastal village which has a Norman church, a visitors centre and a good selection of shops, including a florist, supermarket, Fat Face and Little Giggles (children's shop). After a brisk walk on the beach or an invigorating sail there�s nothing better than a trip to the increasingly popular Deepdale Café, renowned for its hearty English breakfasts. Burnham Deepdale merges into Brancaster Staithe which has an attractive harbour and is just to the east of Brancaster (staithe means wharf, or landing stage). There is a well-supported sailing club here and in the summer at high tide there�s always a crowd of people and boats jostling to get onto the water. The sea still gives a living to many in the area though and Brancaster Staithe is famed for its mussels, which may be bought locally at The Fish Shed or directly from Mervyn's Mussels along the coast road. From the harbour you can take a short ferry trip (at high tide) to Scolt Head Island, a four mile long sand bar housing a National Nature Reserve well-known for terns, oystercatchers, and ringed plovers. The village is a picturesque one, with typical flint walling on many cottages, and popular with second home owners and holiday makers. There is good beer and food available throughout the day at the Jolly Sailor�s pub, or for more of a treat with stunning views and delicious food there�s the White Horse overlooking the marshes. 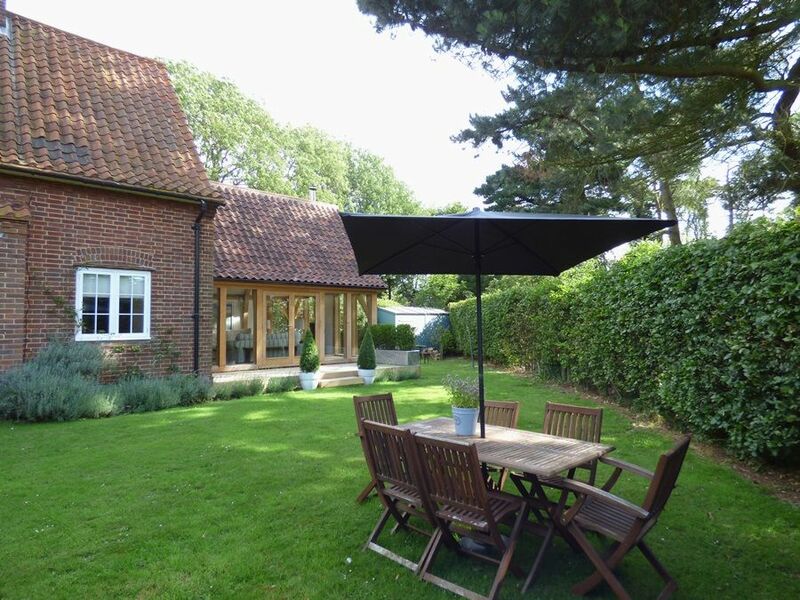 If you would like to see more of our holiday homes in and around the Norfolk coastal town of Burnham Deepdale, please click here.